A grateful patient raised £670 for Pilgrim hospital’s chemotherapy suite to say thank you for the care he received. 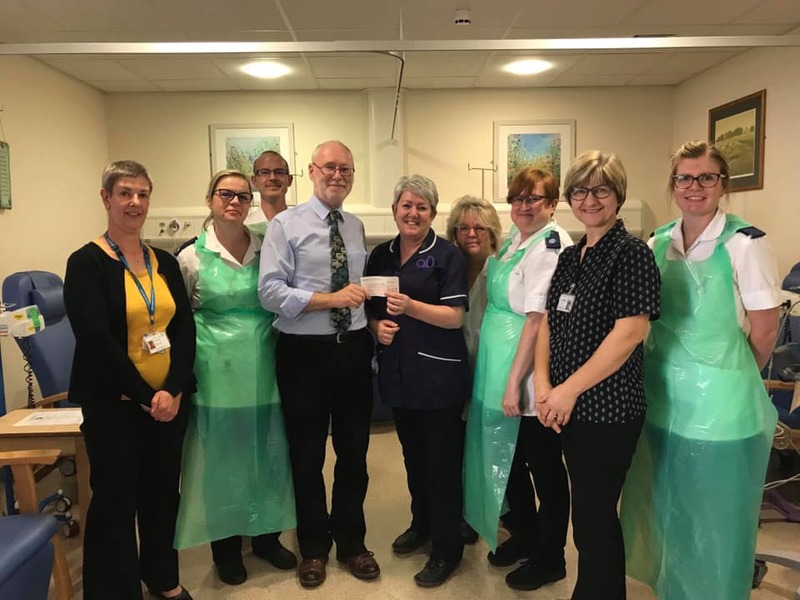 Mervyn Baldry presented a cheque to the staff at the United Lincolnshire Hospitals NHS Trust (ULHT) site while he was in hospital for his 50th cancer treatment, just a few weeks after celebrating his 60th birthday. The cash will go towards buying books for the department for children whose family members are receiving cancer treatment. “When Mervyn was diagnosed a few years ago, treatments for his disease were very limited so his is an amazing story,” said Mandy. Mervyn’s wife, Annette, who works at Pilgrim hospital said: “We wanted to put something back into the hospital we’ve had so much from. “The team in the chemotherapy suite has looked after Mervyn so kindly over the last three years.